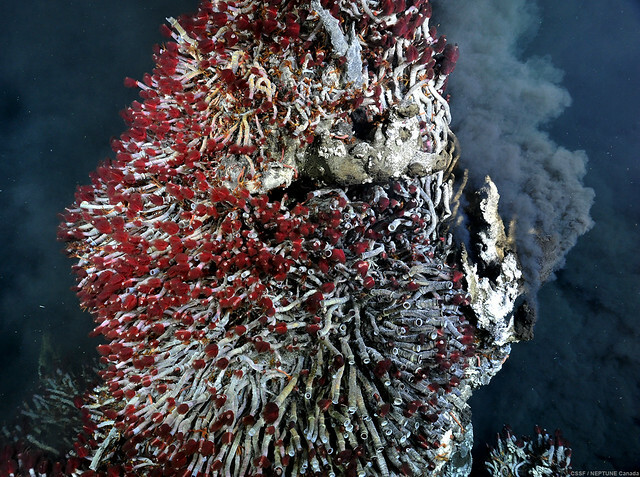 Billowing hot smokers, towering mineral chimneys, and giant tubeworms will be highlights of submersible dives streaming live high-resolution video via the Internet— from one of the most fascinating regions of the deep ocean, located 250 kilometres offshore southern Vancouver Island. The R/V Thomas G. Thompson left Seattle Washington June 11 headed for NEPTUNE observatory sites with a crew of 28 scientists, engineers and educators headed by Expedition Leader Ian Kulin, Associate Director of Marine Operations at Ocean Networks Canada (ONC). The major goals of the two-week expedition are to service and expand cabling of deep water NEPTUNE observatory sites in the Northeast Pacific Ocean. A special focus will be on the Endeavour site, located within a marine protected area along the mid-ocean ridge – a continuous range of undersea volcanic mountains that encircles the globe.